Distribution and habitat: Solanum pseudocapsicum is native to Mexico, Central America, the Caribbean and South America and become naturalised in southern Africa, North America, Hawaii, New Zealand and Australia. It is an small evergreen shrub usually growing 0.3-1m (1-3 feet) tall, but occasionally reaching up to 2m (6.5 feet) in height. It is found growing in forests, forest margins and waterways in temperate and sub-tropical regions, but it is occasionally also found in semi-arid and tropical environments. Sometimes it is considered a weed. This perennial bushy shrub is living up to 10 years and has twiggy branches which carry small, dark green leaves and insignificant star-shaped flowers which bloom in summer. The flowers are followed by highly decorative, long lasting, non-edible berries. Description: Solanum pseudocapsicum has slightly hairy, lance-shaped leaves with stalks less than 1cm (0.4 inch) long. Each leaf is up to 8cm (3 inch) long and 3-4cm (1-1.5 inch) wide and has undulated edges. The leaves are densely arranged along the many short branches that develop from woody stems. Flowers appear from leaf axils, usually in twos or threes, on 2cm (0.8 inch) long flower stalks. Each flower is about 1-2cm (0.4-0.8 inch) across and white with central core of orange-yellow stamens. The oval berries that follow in late autumn to early winter are 1-2cm (0.4-0.8 inch) in diameter and are green, backed by green bracts. The bracts remain green, but the shinny berries gradually turn orange-red as they ripen and they remain attractive most of the winter months. 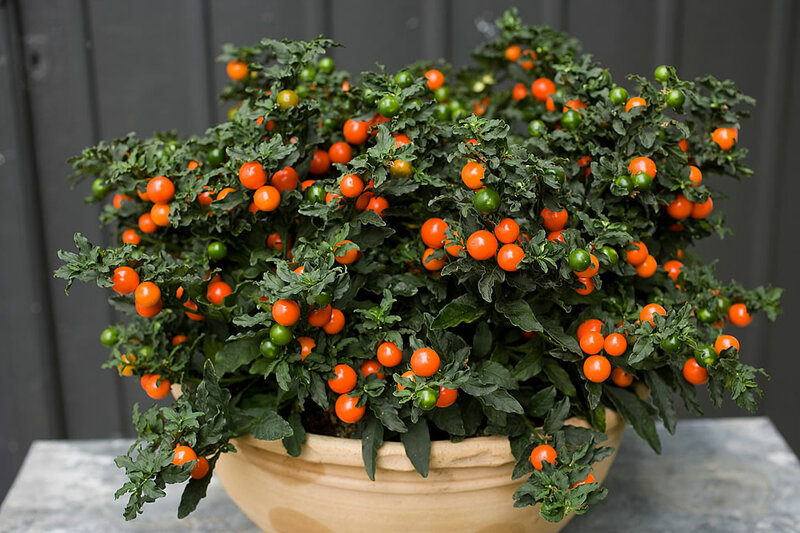 Houseplant care: Solanum pseudocapsicum is acquired when the display of berries starts and generally discarded when the berries have shriveled and fallen off. This is a waste, however as the plants will fruit again the following year if kept under the right conditions. They can be kept outdoors during the summer months. In late spring, just before putting the mature plant outdoors, prune it drastically, cutting out two-thirds of the previous year’s growth. For bushy growth thereafter, pinch out the growing tips of new growth in spring. Mist-spray Solanum pseudocapsicum daily throughout the entire flowering period in order to encourage the fruit to set. Light: Stand Solanum pseudocapsicum in direct sunlight indoors throughout the fruiting period (beginning in early autumn and ending in early spring). Plants to be retained for a second year must be kept outdoors, but sheltered from the midday sun throughout late spring and for the whole summer. Temperature: During the autumn and winter months keep these plants at a temperature no higher than about 15°C (59°F), if possible, and give them high humidity. Warm rooms and dry air will considerably shorten the life of the berries. Stand the plants on trays or saucers of moist pebbles and mist-spray them once a day. During late spring and summer, while plants are outdoors, normal summer temperatures are suitable. In dry weather mist-spray daily the specimens being kept outdoors. Be sure to bring the plants indoors before there is a risk of frost. Minimum tolerable temperature is 10°C (50°F). Water: Water plentifully as often as necessary to keep the potting mixture thoroughly moist, but never let the pots stand in water. If a plant is to be retained for a second season, give it a short rest period for about four or five weeks just before putting it outdoors. During this period water the plant only enough to keep the potting mixture from drying out completely. Fertilising: Apply standard liquid fertiliser once every two weeks, except during the brief rest period. Potting and repotting: Plants which are acquired in late autumn or early winter will not need repotting until mid-spring. To keep the plants for a second fruiting season, move them into pots one size larger (probably 13cm (5 inch) size) before placing them outdoors. It is best to use a soil-based potting mixture. A young Solanum pseudocapsicum raised from seed should be carefully moved into a bigger pot whenever root crowding is indicated by the appearance of roots on the surface of the potting mixture or through the drainage holes. Solanum pseudocapsicum are not normally retained for a third fruiting season. Gardening: Solanum pseudocapsicum is sometimes cultivated as a garden ornamental. In a frost free zone, Solanum pseudocapsicum will develop into a nice 0.6-1m (2-3 feet), woody shrub. These plants are growing best in moisture-retentive and well-draining soil. Water them well and let the soil become moderately dry between waterings. They are sun-lovers and hence it is best to plant them in a sunny location. For best results make sure that the plants are receiving sufficient sunshine and not grown in too windy place which can be too dry for them. To encourage bushiness, prune Solanum pseudocapsicum regularly or pinch the growing points. Also remember to feed the Solanum pseudocapsicum with liquid fertilizer during the active growing period. Plants grown outdoors get pollinated from the wind or insects that carry the pollen from flower to flower. Propagation: Seed sown in the early spring will flower and fruit the same year. Sow the seed in a small pot or shallow pan of moistened rooting mixture, spacing the seeds 1cm (0.4 inch) apart just bellow the surface of the potting mixture. Place the container in a plastic bag or propagating case and keep it in bright light filtered through a translucent blind or curtain until germination occurs (probably in two or three weeks). Uncover the container and grow the seedlings on in a position where they can get maximum bright light with at least two hours a day of direct sunlight. Water enough to keep the rooting potting mixture just moist throughout and begin to feed the seedlings when they are about 5-8cm (2-3 inch) high. About eight weeks after the start of propagation, transplant the young plants singly into 8cm (3 inch) pots of soil-based potting mixture and treat them in the same way as mature Solanum pseudocapsicum. If possible, place them outdoors and keep them there until the berries begin to form in the autumn. Early berry drop indicates either too little light or hot dry air. Solanum pseudocapsicum is sometimes infested by aphids, whiteflies or spider mites. Treatment: Regular misting with tepid water will help to prevent an infestation of spider mites, which prefer hot, dry conditions. Use an insecticide, if needed. Plants that do not bloom usually because they are not getting enough light. Treatment: The cool rest followed by a warm, sunny summer should trigger a flush of new flowers followed by peppers. Do not forget to fertilise it during the growing season. Plants bloom, but do not form fruits because they are not pollinated. Treatment: Plants grown indoors need some help to pollinate. Use a small, clean paintbrush to dab the stamens in the center of the flowers, moving from flower to flower to spread the pollen around. Notes: Solanum pseudocapsicum is regarded as a significant environmental weed in some regions of Australia and New Zealand. Solanum is a large and diverse genus of flowering plants, including two food crops of the highest economic importance, the potato and the tomato. Uses: Solanum pseudocapsicum is well worth growing as a single plant in a pot for the patio where it will become an asset for many years. It is normally bought as an annual indoor plant but can be grown for a number of years. 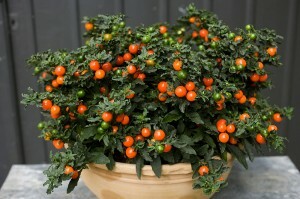 The berries produces by Solanum pseudocapsicum are long-lasting and will “decorate” the plant right through the winter. It makes a great ornamental garden plant in frost free climate. Availability: Solanum pseudocapsicum are usually sold in late autumn or early winter, at time when the berries have started to change their colour – from green through yellow and orange to orange-red. Solanum pseudocapsicum Variegatum is a variegated form which has leaves splashed with creamy yellow or edged with creamy white. Toxicity: Do not eat the fruit of Solanum pseudocapsicum though as they contain toxins. Keep the berries away from children. Ingestion may result in mild poisoning, but it is generally not life-threatening. It may cause gastric problems, including vomiting and gastroenteritis. They are also highly poisonous to dogs, cats and some birds.